Ted is the first man we've ever seen Buffy's mom go out with. He appears to be perfect in every way -- he seems to really care about Joyce, tries to make an effort to befriend Buffy, Xander, and Willow, and boy, can the guy cook! He's Mr. Wonderful, or so it seems. All of this is too much for Buffy to take, which causes her to have some parental issues. Ted takes the gang golfing, gives them cookies and mini-pizzas, makes Buffy and her mom dinner. But he tends to speak using what I call "fifties-isms." He says "malarky" a lot. And he becomes a different person when Buffy's mom isn't around. Tension mounts and pretty soon Buffy thinks she's killed Ted when she hits him and he falls down the stairs. He's not exactly dead, but no one knows that. Later we find out that the guy is really a robot, and he plans to make Joyce into a robot-wife, too. Buffy takes care of him, though, leaving her mom none the wiser. Again. 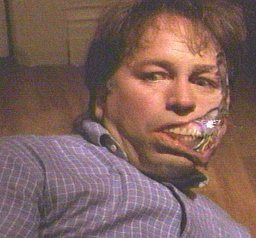 Ted was played by John Ritter, a fact that I enjoy with much glee. The Three are reportedly the strongest vampires that serve The Master. They go out with the orders of killing Buffy, and almost succeed. But Angel comes to Buffy's rescue, and the two of them manage to beat up a little on the vampires before making their escape. The Three pursue Buffy and Angel to Buffy's house. But since they haven't been invited in, they can't enter her home. They return to The Master and let him know that they've failed. They offer up their lives in penance, and they die by Darla's stake. Each of The Three seems to be dressed in some weird-looking plated clothing. And at least 2 of 'em have long hair. See also: Absalom, Dalton, The Gorch Brothers, Pork 'n' Beans Vamp, and Mr. Trick. Tom is Richard's fraternity brother. Against her will, Buffy is dragged by Cordelia to go meet the 2 guys. Tom plays the "I'm a sweet, bashful guy" routine which softens Buffy up, even though she still refuses to go to the frat party that he's invited her to. As it turns out, she does go, she dances with him, and later finds herself chained to a wall with Cordy and Callie. It's then that the chicks realize that the fraternity is some secret order that reveres a snake-like entity called Makita. The girls are to be offered up as a sacrifice to Makita so that the guys might preserve their wealth and power. Callie warns Buffy that "one's of them different than the rest..nicer....he's the one to watch out for." Turns out that gentle Tom is the most evil one of the frat guys; he bears plenty of "sacred scars" and is ultimately the one who'll be feeding the girls to Makita. When Buffy tries to bait Makita into taking her instead of Cordelia, Tom slaps her. Buffy breaks free of her chains and gives Tom the pounding of his life...we're then led to believe that he and the others are carted off to jail. Hey, at least he won't have to go through rush again. Sort of. Thomas has the distinction of being the first vampire that Buffy spots at The Bronze. Giles asks her to prove her ability to spot vampires, and she picks Thomas on the basis of his "carbon-dated" clothing. Thomas also has the distinction of being the first vampire that we see Buffy slay. Basically, after Buffy outs Thomas as a vamp, she sees Willow taking her "carpe diem" advice -- Willows strikes up a conversation with Thomas and then leaves with him. They're supposed to go for ice cream, but Thomas leads Willow to the cemetery and shoves her into the mausoleum. Buffy and Xander arrive on the scene, and Buffy dusts Thomas swiftly. So much for the ice cream, eh, Thomas?